In 1519 Portuguese explorer, Ferdinand Magellan (1480 -1521) was commissioned to find an eastern trade route to the exotic wealth of the East Indies. This was the first recorded circumnavigation of the world. Now, being the first can be great, however not only did he die in his effort but in 1522 only 18 of the original 237 men returned.They did managed to bring back five exotic shimmering skins full of colourful feathers obtained in Malaka. They were meant as an example of potential trade goods in feathers, but ended up as "stuffed" as a tribute to King Charles V of Spain. A perplexed "animal stuffer"(taxidermist) could find no evidence of LEGS on the skins. It is logical that for the purposes of long voyages in a tropical climate, the legs and visera were removed in an effort to preserve such beauty. So it came to pass these colourful exotic birds, yet to be classified, became "birds of Perpetual Flight...mythical creatures that lived on the sun's nectar", in the absence of any scientific explanation. Consequently there was a high demand these creatures in European Curiosity Cabinets. As early as 1596, the Dutch explorer, Jan Huygens van Linschoten already had an enthusiastic entry in his log book about the Bird of Paradise as demand was high. The Dutch East India Company no doubt exploited this cabinet display demand killing tens of thousands for their curiosity value alone, to the detriment of all Birds of Paradise...and all this before the feathers were prized adornment of ladies bonnets & military attire in the 1800s. Moral is, it does not pay to be so beautiful or majestic as once you are discovered your end is nigh! It wasn’t until the famous Swedish naturalist,Carl Linnaeus (1707-1778) examined the preserved birds that he ended the idea of perpetual flight. His "biological binomial nomenclature system" put that idea to bed once and for all. He was also the originator of the name "Bird of Paradise". A man of many skills, Levaillant was also a naturalist, zoological collector, noted ornithologist and author. He was stoutly opposed to Linnaeus’ Latin classification protocol. He favored the use of of descriptive French names. It is for this reason that his spectacular exotic bird publication “Histoire naturelle des oiseaux de Paradis ...” , published Paris 1801-1806, have names like “Le Nébuleux étalant ses parures”, or “The Nébuleux Spreading its trimmings” and “Le Superbe étalant ses parures”, or “The Superb spreading its trimmings”. On his return from his numerous voyages, he sent over 2,000 bird skins to Jacob Temminck, who financed his expeditions. Temminck son, Coenraad Jacob Temminck studied them. They later sent to the Lieden Museum collection, others were bought by the Rijksmuseum van Natuurlijke Historie in the 1820s. it is these mounted specimens that the renown artist Jacques Barraband paints in preparation for Levaillant's publication. 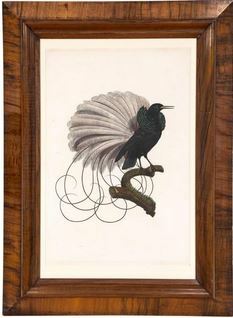 Zoological and botanical illustrator renowned for his life-like renderings of tropical birds. “Jacques Barraband was commissioned personally by Napoleon Bonaparte to contribute his masterful art to this fabulous grand folio sized book of exotic birds - to which absolutely nothing compares.” His paintings were based on mounted, taxidermed, specimens collected by Levaillant. Note that our specimens from this series have their legs! His illustrations were, and still are, considered the most accurate ones made during the early 1800s. His most famous works are those illustrating François Levaillant’s scientific ornithological studies, the “Histoire naturelle des oiseaux de paradis…” . These were among his last. It seems the engraver Langlois, who is and engraver of botanist Pierre-Joseph Reoubte, also translated Barraband exquisite exotic watercolours into print.